The Municipal Transport Company of Madrid (EMT) is continuing its massive fleet renewal with new acquisitions that includes hundreds of buses powered by natural gas. In the 2016-2020 period, EMT will complete the renewal of 60 percent of its fleet by acquiring 1,222 new buses. The size of the investment is not only a milestone in the history of the municipal company but is one of the largest in Europe. Spending almost EUR 390 million on the project, Madrid’s primary public transportation provider says that by the end of 2020 the entire EMT bus fleet will be ‘eco’, that is, zero emissions or low emissions. In addition to this heavy investment in fleet renewal, actions have also been taken to adapt the existing fleet for an amount exceeding 3.22 million euros. And, in parallel, EMT is carrying out an important investment, which exceeds 18 million euros, in the improvement of the Operations Centers in order to adapt its technical facilities to the new bus propulsion systems (CNG, hybrids, electrical, induction). Regarding the new mobile material, in the period 2016-2018 EMT has acquired a total of 697 buses for an amount of 216.1 million euros. 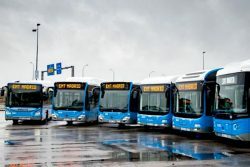 Of these almost 700 vehicles, 590 are standard buses powered by Compressed Natural Gas (CNG), 54 are articulated CNG buses, 30 are standard hybrid buses, 15 are standard electric buses and 8 are electric minibuses. For this year and next, the purchase of 525 more buses is planned: 460 standard CNG buses, 55 standard electric buses and 10 electric minibuses. For this purpose, EMT will invest 92.6 million euros in 2019 and 81 million euros in 2020. Regarding the adaptation of the existing fleet, 98 buses with more than 10 years of service have been completely renovated and 5 hybrid units have been transformed into electric vehicles with induction charging system. Likewise, automatic fire extinguishing systems have been installed throughout the fleet.